Nightcrawler is now showing in Australian cinemas and is distributed by Madman Films. Now showing in the United States and United Kingdom. 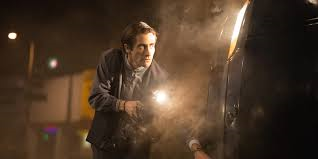 Intriguing and incredibly unique, Nightcrawler is a brilliant portrait of the modern world of crime journalism and of a memorable but disturbing character by the name of Lou Bloom. With its highly intelligent and well written screenplay, Dan Gilroy's film is incredibly unpredictable and suspenseful and captures the atmosphere of the crime climate of Los Angeles, but still manages to do so in a tasteful and captivating fashion. Jake Gyllenhaal gives an absolutely superb performance of one of the unsettling characters you find creeping around Los Angeles in the night. Nightcrawler is clearly one of the best, if not the best psychological thriller of the year. In his own words, Lou Bloom (Jake Gyllenhaal) is a hard worker, sets goals high and is persistent. He is all these things, but he is also a mysterious and unnerving individual who has the power to make those around him believe and do whatever he wants. While seeking a new job for himself, he stumbles onto the world of crime journalism quite by accident and sets his sights on making sure he becomes the first on the scene of crimes across the city of Los Angeles. He teams up with Nina (Rene Russo), a TV news worker who embraces Lou's exclusive video footage as it gives her channel an advantage over rival news stations. It isn't long until Lou starts to realise that in order to get to the top, he needs to have some control over the world he is reporting on. Nightcrawler is a brilliantly written and unique piece of work. It is extremely modern in it's concept as it paints an intriguing, but bleak and disturbing picture of the nature and changing face of news journalism. While the sly Lou Bloom convinces those around him that he is freelance, his lucky break comes at the hands of the relatively new concept of citizen journalism. In this age of technology where virtually everyone has access to the tools traditionally used by trained individuals to distribute news, anyone can report as the professionals do. Citizen journalism extends to individuals capturing events as they happen on their mobile phones and that footage being broadcast due to it's exclusiveness and speed. This is where Lou's adventure in crime journalism begins and with his skills of persuasiveness allows people in powerful positions to believe that he is in fact a professional rather than someone who has only decided to take up this business as a result of being out of a job and looking to make a quick dollar. He purchases a camera and mimics what he sees other crime journalists do, but also constructs the elements to make things go his way. Although Nina and her co-workers are unaware of who Lou actually is and that he is only freelance in speech to begin with, this presents one of the complexities of citizen journalism which is that its accuracy can sometimes be questioned as it is not completed by a professional. The question of ethics in news journalism certainly also comes into play during Nightcrawler. The way the news team in the film approach the video footage which they broadcast is purely to do with how much they can show without getting sued. Their aim is to do whatever they can to beat out their rival news programs and empathy for those who are in or directly affected by the footage is non existent. Their boundaries are defined by what they are legally bound by and they relish finding loopholes in these formalities, while humanity plays very little part when working to win ratings. 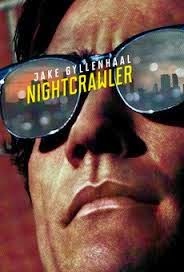 Nightcrawler brings to light the ugly side of crime journalism, a concept which is traditionally not a pretty one to begin with. The film itself is driven by the startling high crime rate of present day Los Angeles, which is a feature of the city that Lou and crime journalists strive in as it is good for business. Even though the story focuses on this unattractive part of the City of Angels, the way it is depicted visually is rather exquisite. The opening sequence of the film features some of Los Angeles landmarks which are not usually associated with pop culture, but are familiar to those living in the city and are beautifully shot. For a film which is shot more at night than during the daytime, the use of colour is entrancing. The cinematography is really something special as the film calls for so much variety in the way it is shot due to it's changing pace and constant intrigue. Jake Gyllenhaal is nightcrawler Lou Bloom in every way. Lou Bloom is an extremely complex and wildly intriguing character with psychopathic tendencies and Gyllenhaal portrays him with perfection. The film doesn't give away much about his past, but it doesn't need to as there is a strange comfort to knowing who he is only in the present. He isn't a particularly likable character, yet the audience forms a connection with him based on his intrigue and unpredictability. Gyllenhaal is truly magnificent in this role and completely embodies the creepy and manipulative Lou Bloom. Riz Ahmed, who plays Lou's reluctant sidekick Rick, is also fantastic and connects with the audience on a more sympathetic level than Lou. Rick is a man who has made the wrong choices in life, but is trying to set things right only to find that it is not as easy as he thought, especially with a boss like Lou. He is a great deal more likable than Lou and there is a longing for him to be the hero of the story. Ahmed is believable and again, capable of evoking a great deal of sympathy. Rene Russo also does well as Nina, who is clearly struggling to maintain her strength in order to get where she wants to be. Nightcrawler is as unsettling as it's name suggests, but in the best possible way. An exciting and suspenseful journey which makes you ponder how far people will really go for what they want.